Time for a break—a chocolate break! With so much going on between publishing As the Crow Flies, doing Christmas things, and tending to the everyday stuff, I am certainly ready for a few minutes of peace and quiet! I’m also quite fond of “easy,” and this recipe fits the bill. Doesn’t take very long to throw together, and hey—it’s chocolate! I’d actually been looking for some tasty way to use up a box of saltines. My family just doesn’t eat them that often, but we always have a box. They do go nicely with chicken noodle soup when your tummy’s rebelling… Now, however, I think I might have to make sure we always have a box of crackers on hand, because these little sweets are yummeh! Yes, I ate most of them myself the first time around. And I’m craving them again. So, I’m going to leave you with this recipe, and go make some for me! Line 1 large or 2 small jelly-roll pans with aluminum foil, spray with nonstick spray and arrange the saltines salt-side down in a single layer. In a medium saucepan, melt the butter and brown sugar together and boil until it turns a caramel color, a few minutes. Remove from the heat and pour over the crackers, covering them evenly. Put the jelly-roll pan into the oven and bake for 8 to 10 minutes, or until just bubbly, watching carefully. Remove from the oven and sprinkle the chocolate chips over the crackers. When the chips melt a bit, spread them over the crackers with a knife. 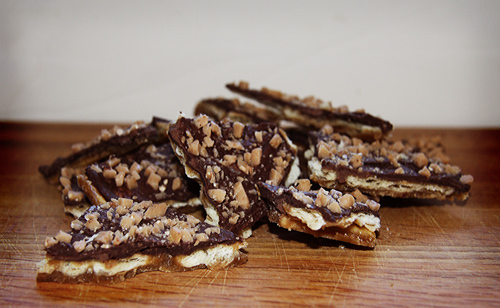 Sprinkle with toffee bits. Cool. Transfer the pan to the refrigerator or freezer for 20 to 30 minutes, or until completely cold. They will form one big sheet. Break up into pieces. Store in an airtight container. These make good gifts, too! I’m always on the lookout for good (chocolate) recipes to try. So what’s your favorite way to consume chocolate?